Chen Dongfan: Nevermore installation view. Photograph by Peichao Lin ©Chen Dongfan, courtesy Fou Gallery. 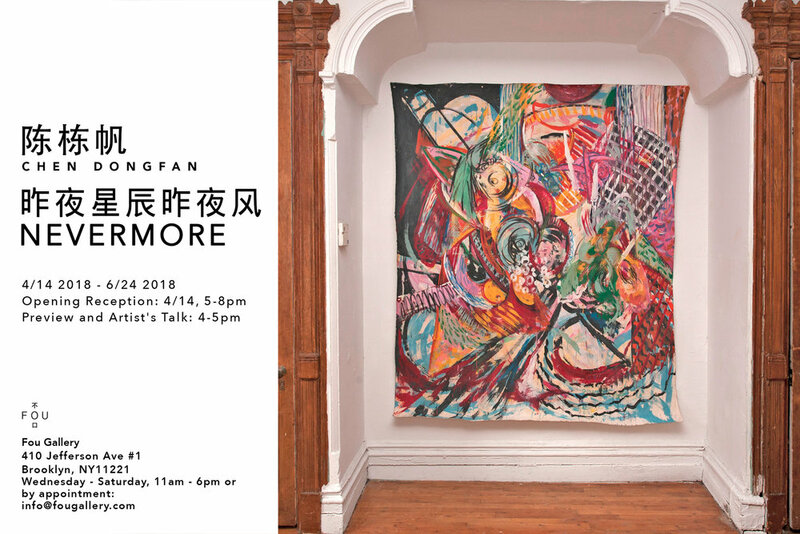 NEW YORK - Fou Gallery is pleased to announce that the new exhibition Chen Dongfan: Nevermore will be on view from April 14 to June 24, 2018. This is Chen Dongfan’s second solo exhibition with Fou Gallery, following his debut with the gallery in 2017. 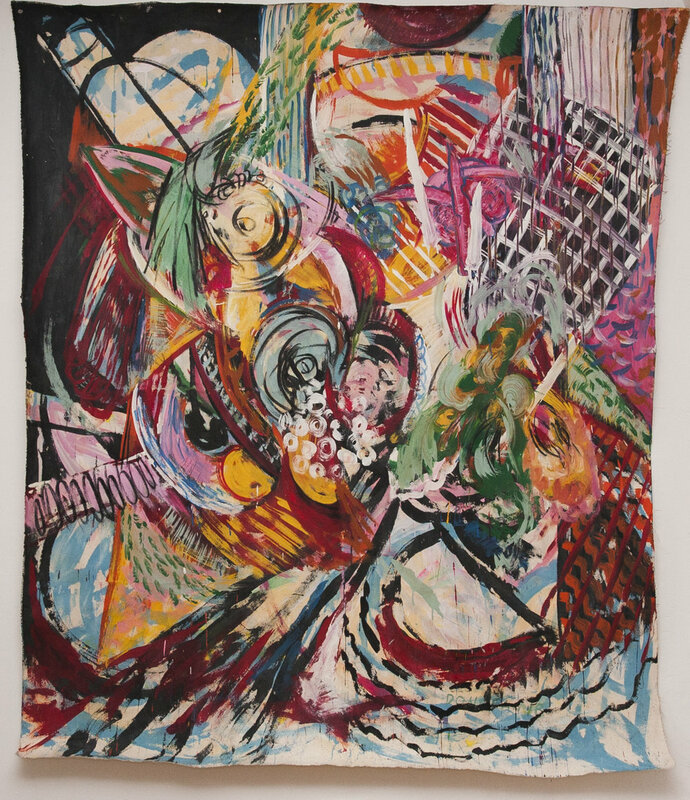 The exhibition includes a collection of Chen’s recent abstract works that shows an increasing tendency of improvisation. The exhibition’s Chinese title “Zuo Ye Xing Chen Zuo Ye Feng (昨夜星辰昨夜风)”, which literally means the breeze and the stars from yesterday evening, is an excerpt from the poem “Untitled” written by Li Shangyin, a foremost Chinese poet of the late Tang Dynasty. The English title “Nevermore” was inspired by Edgar Allan Poe’s poem The Raven, in which "Nevermore" is repeated eleven times. Chen suggests that the exhibition title and and his works should be viewed separately. However, the subtle connection between the Chinese and the English titles activates an imaginative space, which seems metaphoric and elusive. Why does Chen choose the two poets? Li’s poem, though cryptic and allusive, reveals his deliberate depiction of subtle and mysterious emotions in love. As a forerunner of Symbolism, Edgar Allan Poe suggested the idea of "pure poetry”, as a means to celebrate the aesthetic reflection of formalism, allusiveness and rhythmic juxtaposition. These poetic features resonate with Chen’s vision in his recent works, revealing a lyrical connection with these two poets. “Soul and Spirit” has been the main theme of Chen Dongfan’s artistic practices in recent years. As Chen suggests: “The brushstroke is the reflection of my spirit. I gaze at it and wait for the right moment.” Over the past few years, in pursuit of a certain degree of purity and freedom, the artist confines himself in his studio and freely explored the internal world with painting. To prepare for this exhibition, Chen spent 11 days in his new studio to complete the Space Painting Project (Studio, 2018), as a visualized recreation of a scene from Somerset Maugham's novel The Moon and Sixpence. In the novel, the artist Strickland painted a masterpiece about the Garden of Eden on the walls and floors of his hut on Tahiti island before he went completely blind. Knowing that he is going to die, he commanded his wife to burn down his masterpiece. 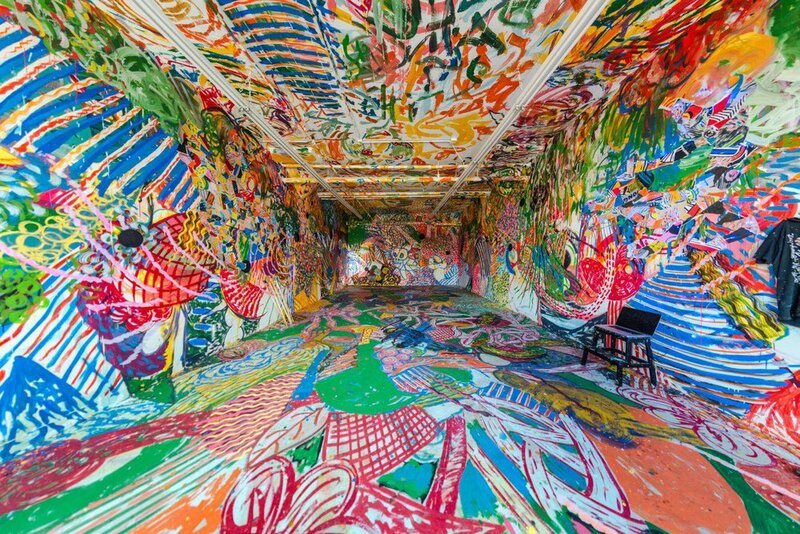 Chen Dongfan's space paintings extend from the ceilings to the floor and four walls, presenting a wild and dynamic space filled with bizarre moments. Even though a concrete imagery is absent, the vitality of life is present through the explosion and fluctuation of lines and colors. The works presented in the current Fou Gallery exhibition were mostly created in the new studio, conveying the artist's pursuit of spiritual significance through pictorial forms. The narrative in Moon and Sixpence is based on the life of the French artist Paul Gauguin, who also created a painting titled Nevermore after he moved to Tahiti island. While Chen initiated an imaginary conversation with Strickland in his painting process, the title of this exhibition is also an attentive homage to Gauguin. The context in the Chinese and English titles work together as an unique narrative, echoing both the works exhibited in the gallery space and the space paintings in his own studio. During this exhibition, Fou Gallery will arrange open studio, concert, performance and other special events. These future activities will produce greater possibilities to enhance the exhibition and build a connection between the gallery space and the artist’s studio. *English translation by Yan Yu based on texts by Aubrey Wang. The opening video for Chen Dongfan: Nevermore at Fou Gallery, New York. Videographer: Tianxing Wan, courtesy Fou Gallery and Chen Dongfan Studio.